Not compatible with MC7108's camera, suitable for vehicles less than 23 feet in length. 4. Built-in Haloview SMART IR-CUT, filter makes image more realistic.Getting rid of color blur. 5 .Built-in mic and speaker for audio. Auto dim function is available. 6. Built-in recorder. Real time recording, video playback. 7. Low-power-consuming.The camera will enter low-power-consuming mode to save power if wireless camera is not connected to monitor for 30 seconds. 9. 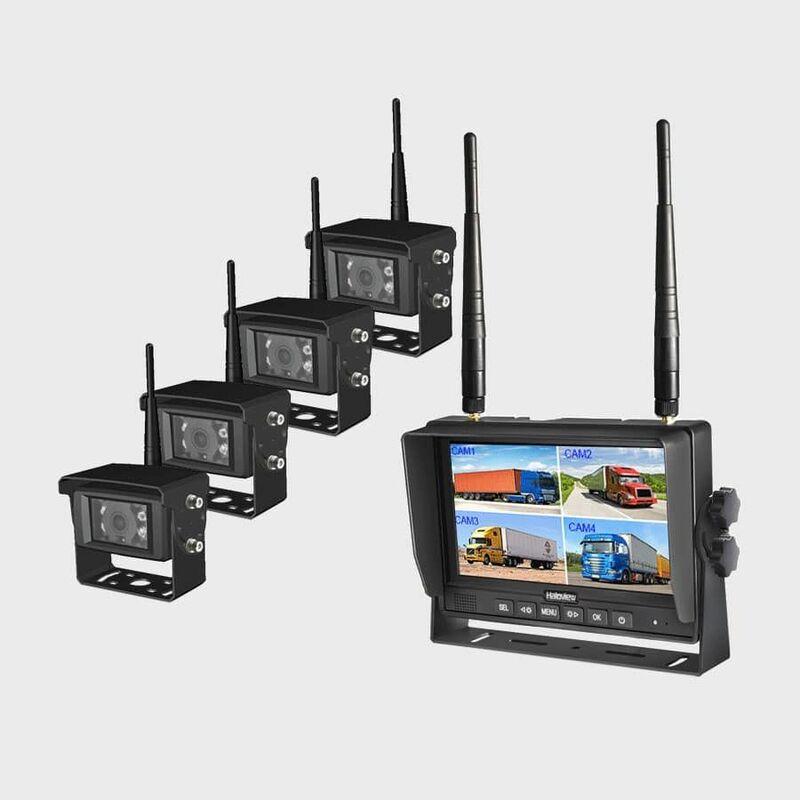 Instant auto pairing: the wireless camera and monitor pair together happens when camera is activated. 10. Latency of 120ms, which is imperceptible. 12. 120° wide viewing angle with 120m range line of sight. 13. IP69K waterproof level(highest IP rating) and 10G vibration rating. With a 16:9 LCD display and 800x480 resolution, 400 cd/m² luminance and maximum 4 wireless cameras, the image can be very fluent and clear. Frequency-Hopping Spread Spectrum (FHSS) is adopted in this system to improve anti-interference ability and guarantee image quality. Auto dim function makes the monitor automatically adjusts the backlight to fit the ambient light. The trigger can help switch screen display automatically without pressing button to avoid diverting the driver's attention during driving. 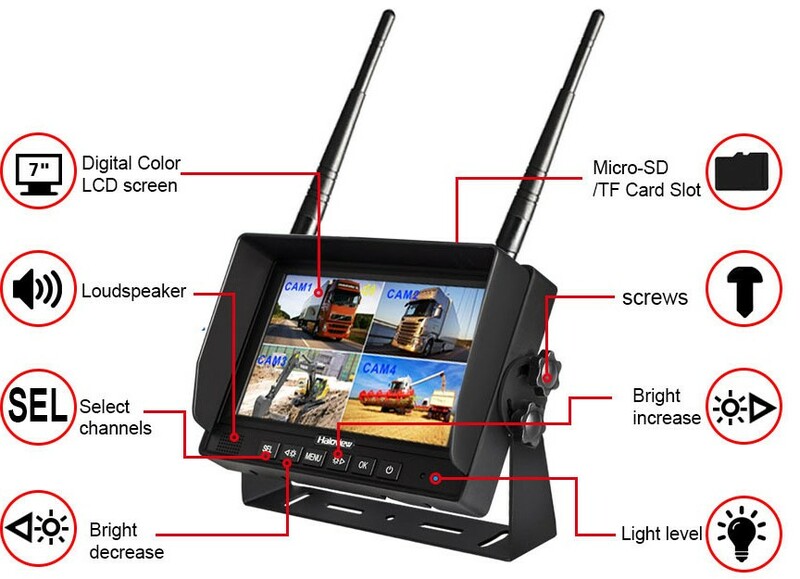 It also has built-in 2.4Ghz wireless video receiver with NTSC/PAL format. Built-in DVR makes it a stable and easy-to-use system. It supports both 4-channel and single-channel recording in AVI signal format. All shots can be recorded on a Micro-SD card or TF card with maximum 128G storage, and it will overwrite the previous data when the card gets full. 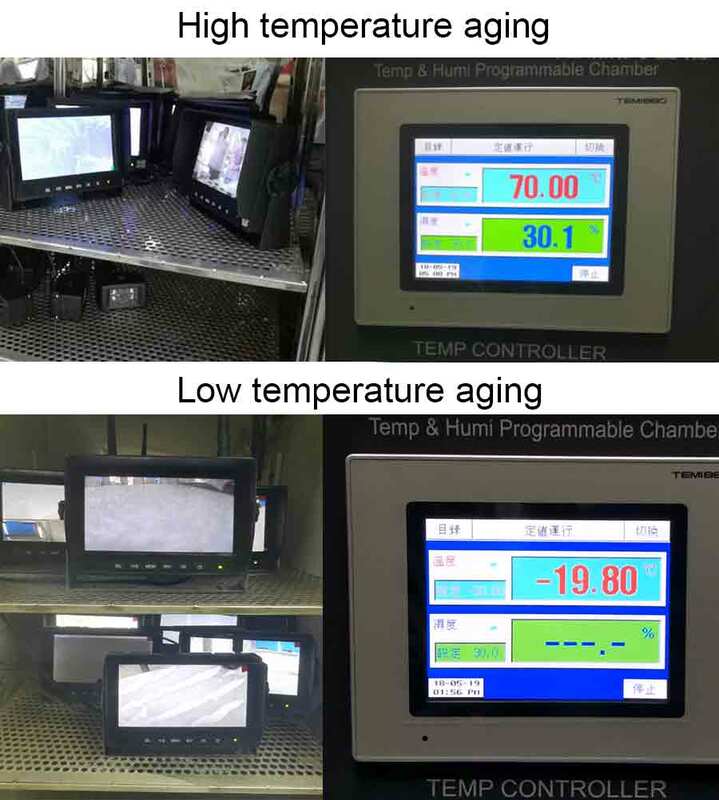 With the receiving sensitivity of -89 dBm in the monitor, the transmission distance can reach 120 meters, the Monitor has parking lines, which help the driver to judge speed and distance accurately. 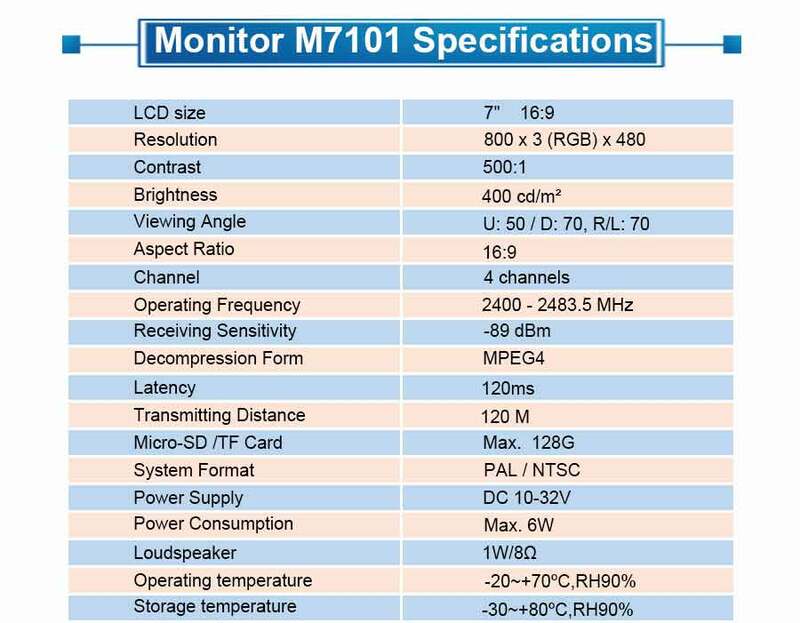 MC7101 system also has Built-in mic /speaker which enables you to hear the sound nearby. 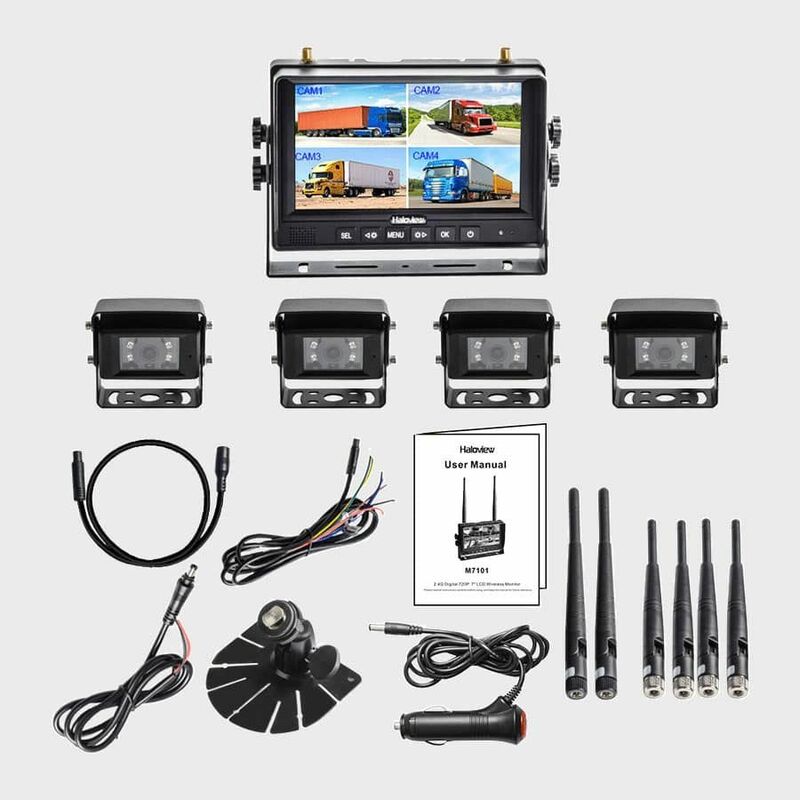 This system can be applied to a variety of vehicles that need view assistance for driving such as buses, trailers, trucks, SUVs, vans, RV, agricultural etc. The power supply is wide from DC12V to 32V so it is perfect for all kinds of heavy-duty vehicles. Haloview makes your driving safer and easier. It produces 120° wide viewing angle, with 756*504 pixels and greater viewing flexibility when compared to conventional wide-angle lenses. It has 4 high power IR lights providing 32 feet of night vision. The minimum illumination for the camera is 0 Lux with power supply ranging from DC 10-32V. Its IP69K complete waterproof rating make it works well under damp environment. The camera has an adjustable heavy metal sunshade, which can protect the camera from glaring and flaring. With a 10G vibration rating, this camera is strong, reliable and shock-resistant. The 4 high power infra-red lights can offer better night-vision images. The infra-red sensor will open automatically at low light. If you use 650nm filter at daytime, it will automatically switch to 850nm at night. It makes color more realistic and avoid color blur. 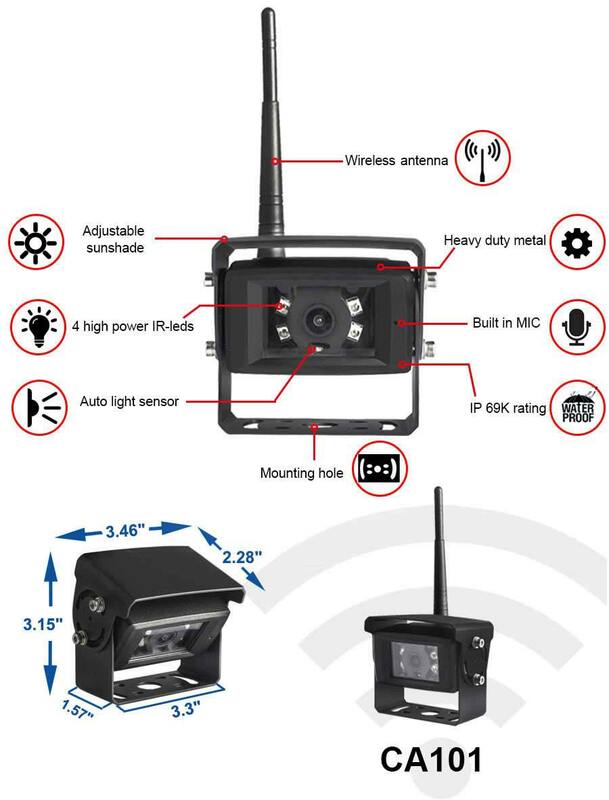 If wireless camera is not connected to monitor for 30 seconds, the camera will enter low-power-consuming mode, which can save power by turn off the monitor when you are using battery. How do you know whether it's at low power mode? Cover the sensor with your hand, if the infrared light is on, then it’s not at low power mode. 1. Press SEL button to select a channel that needs to be paired. Method 1: Enter menu interface and select PARING, press OK to confirm, you will have 50 seconds for pairing. Method 2: Press OK button for 3 seconds to enter PAIRING status, you will have 50 seconds for pairing. Method 1: Press the pairing button on the back of the camera. Method 2: Power off the camera and power it on again. 4. Video will be displayed after pairing complete. Note: If no picture displayed after pairing, please retry pairing steps and power-on again the camera. 1. Please power on the camera at the intended position to test the signal strength before drilling. Do not drill until the signal reaches 4 grids. 2. 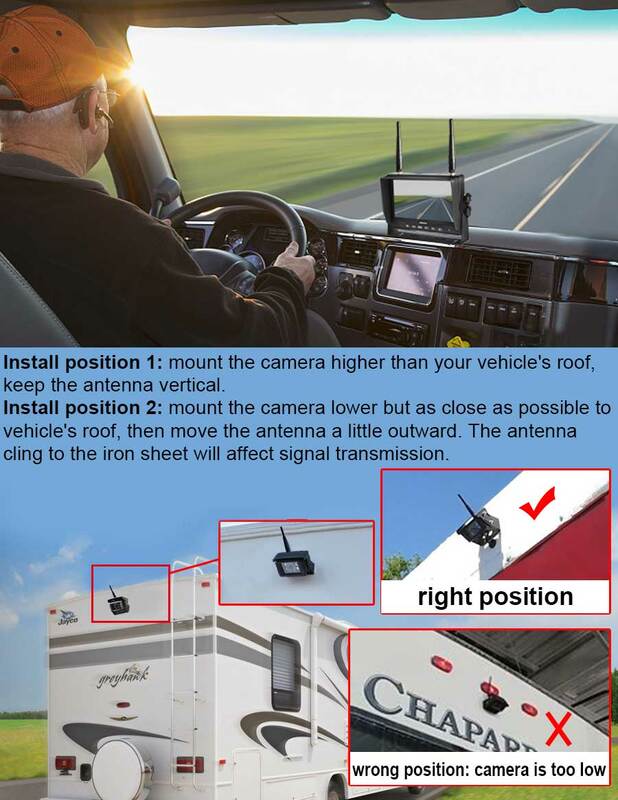 Install the camera higher than your vehicle’s roof or close to the roof and move the camera's antenna a little outward, the antenna cling to metal will affect the signal. If you having trouble with signal reception, please do contact us immediately(with photos will be perfect),no matter where you bought it.We will reply within minutes during working time. 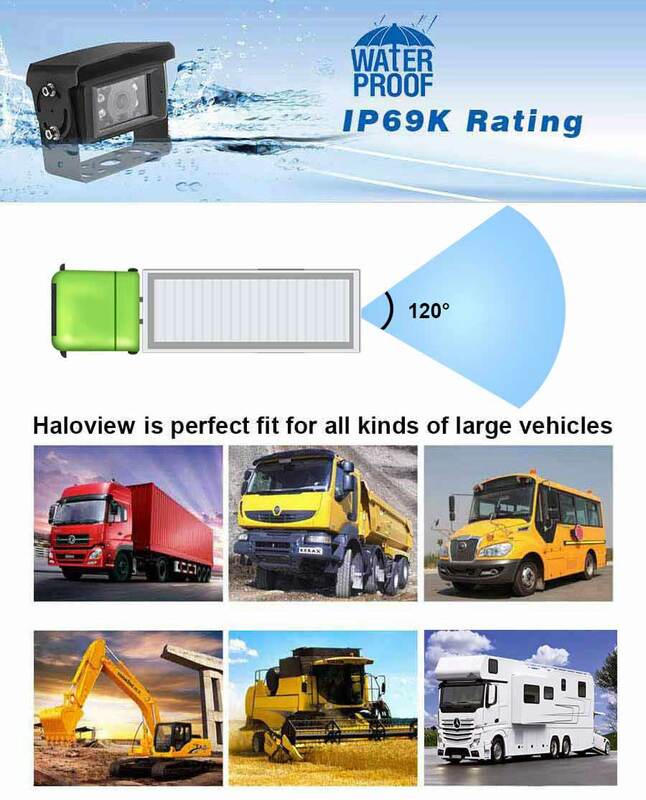 3.Haloview's rear view system use anti-glare screen,please tear off the monitor's screen protection film which may cause reflection after installation. Made up of an elite team of techies who want to spread the word about Haloview products. Once selected you will be sent Haloview products based on your preferences. You can use the product freely and form your own unbiased ideas about the product. Within a week’s use. You would need to post the feedback and review of the Haloview product to your social media followers. Your feedback will influence how we make improvements in the future. 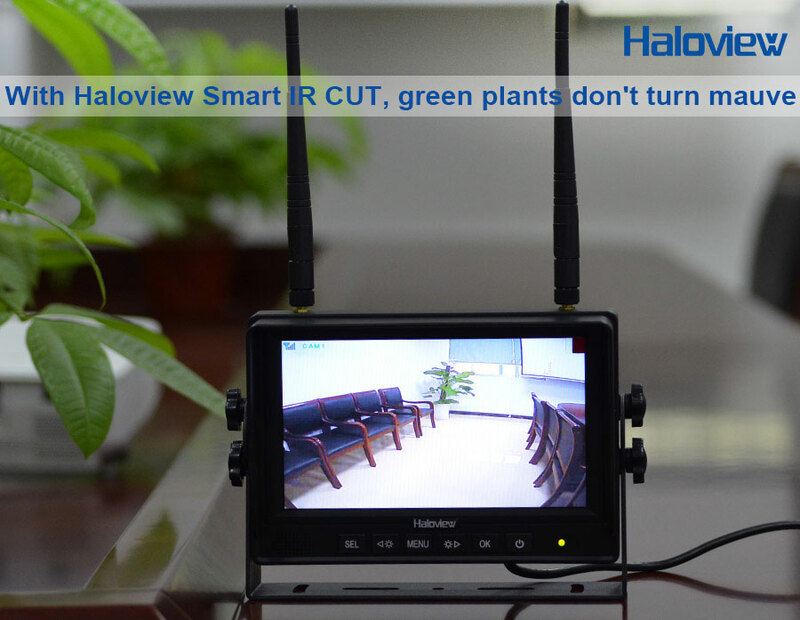 Q: What are the differences between Haloview wired and wireless camera systems? A: 1. Wired system has stable image than wireless system but the installation is a bit troublesome, wireless system is more easy to install. 2. The wireless system is recording available, but the wired system has no recording function. 3. 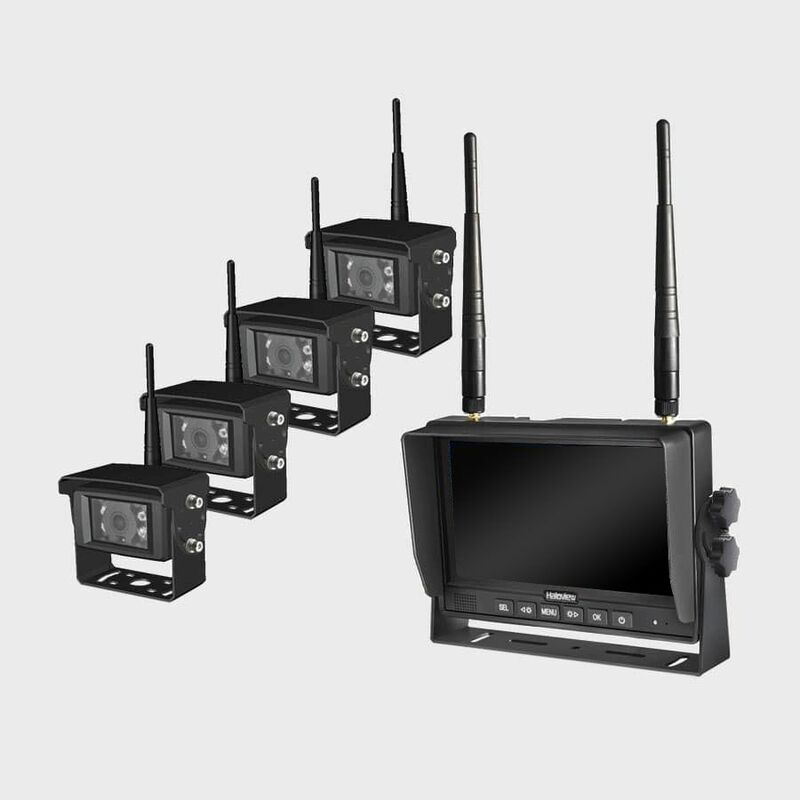 The wireless system support split mode and 4 cameras are available, the wired system don't support split mode and 3 cameras are available. 4. The wireless system support low power consumption function, but the wired system don't support low power consumption function. 5. 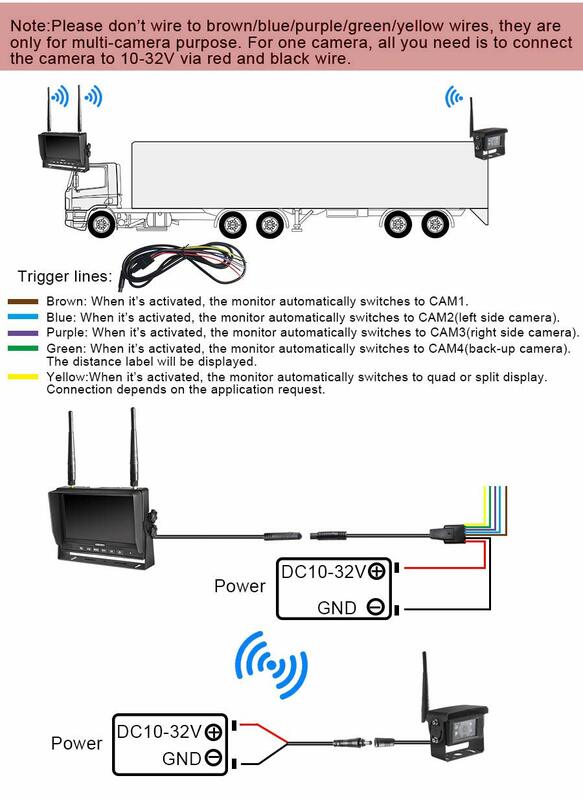 The monitor and camera of the wireless system are powered separately, but the camera of the wired system is powered by the monitor, the camera will not work as long as the monitor is turned off. 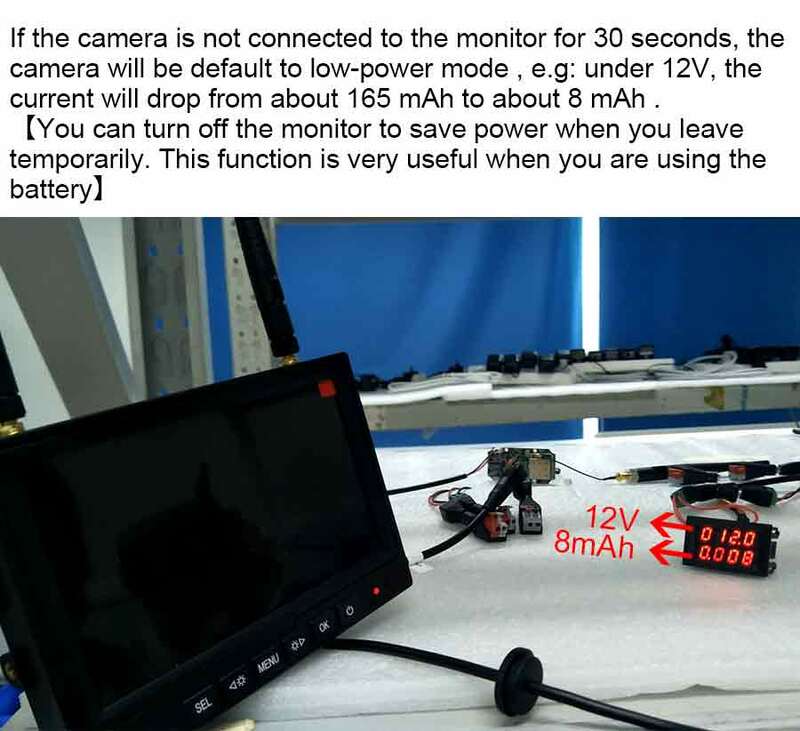 A: If the camera is not paired with monitor for 30 seconds, it will enter low power state, you need to re-disconnect camera power, and then re-power the camera before pairing. A: Brown, Purple, Green, Yellow, Blue ---- These lines are trigger lines and do not need to be connected for normal use. A: Taking the surrounding environment into consideration, is there a lot of WIFI signals around? Is the antenna blocked? If the iron sheet blocks the signal, please increase the antenna extension cable to solve the problem. If the antenna is too close to the iron sheet, please change the antenna orientation. Q: How long does it take to install a Haloivew rear view camera system? A: Installation time varies based on vehicle and camera quantity. a standard one camera wireless system should take half hour to install. with 4 cameras takes about 1 hour.Wired system with 1 camera takes about 40 minutes, 3 cameras takes about 2 hours. Q:What distance does the wireless transmission cover? 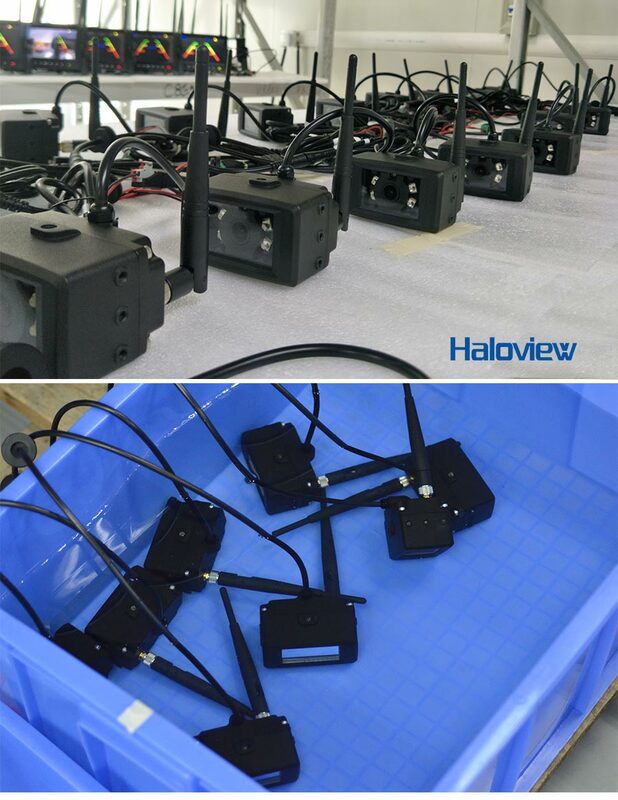 With excellent anti-interference capability, the transmision distance is 120 meters(about 393.7 ft) free of barrier, and its latency is only 120 ms.
Q: What vehicles can Haloview wireless systems be applied for? 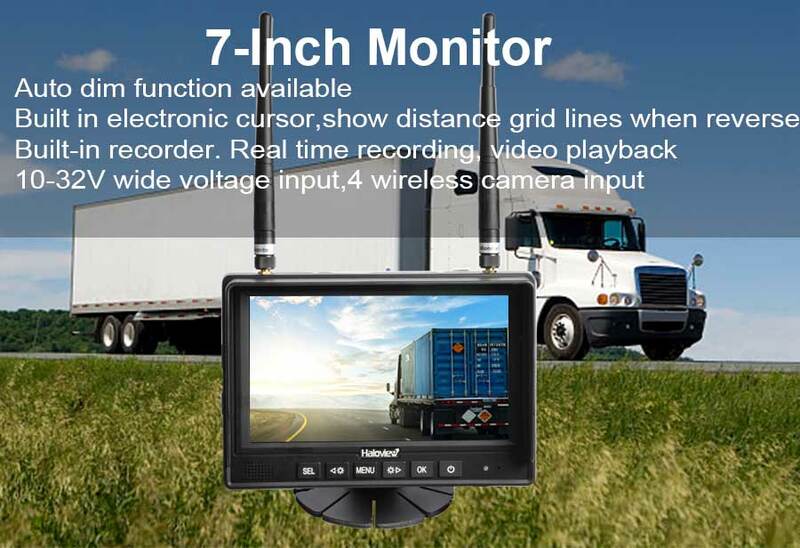 A: Haloview wireless backup cameras could be applied for heavy-duty vehicles. It could be used for harvester, navvy, farm, forklift, crane and planter etc. 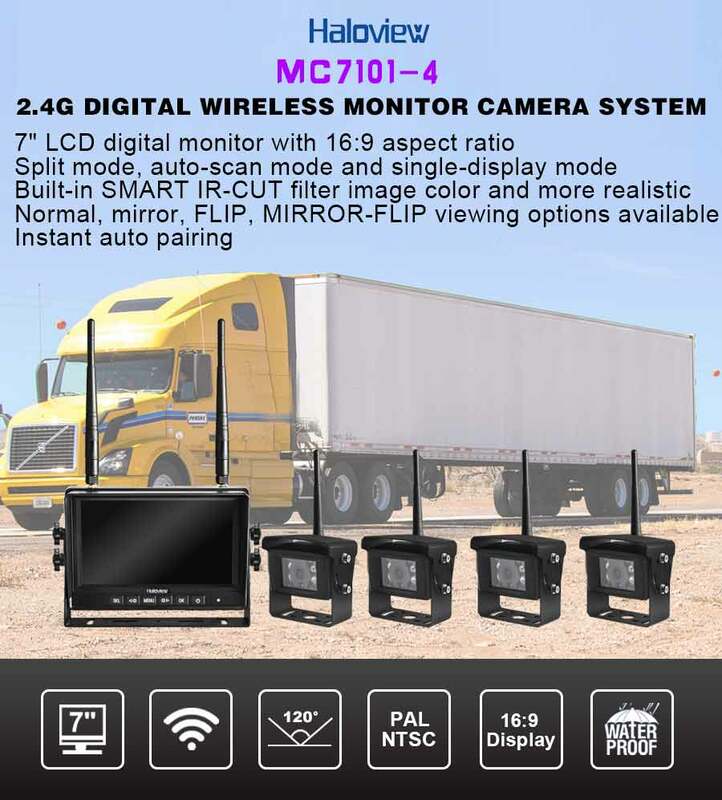 For those vehicles like fifth wheels, travel trailers or semi-trucks, you can choose the wireless back up camera which is easier to install. Q: Do your systems get interference from other wireless devices? A: No, our systems use a fixed wireless signal (technology similar to Bluetooth) that guarantees no interference from other devices. Also, FHSS Technology guarantees the privacy and anti-interference of communication. Q: If it's wireless, why do we have to run a wire to the camera? A: The connection between the camera and monitor is wireless, however, each part still needs to be powered by wires. Q: What is the power supply for a wireless backup camera? A: The camera needs 10-32V of power, which can be supplied by the reverse lights or the running lights. Q: I can't play the recarding of AVI? I can't play it in my iPad. A: Install a different video player support avi, like VLC player,Baofeng, PlayerXreme etc. Apple's system doesn't work due to copyright issues. Q: Can you please tell us what size drill bit we need for the black grommet on the camera cable? I purchased a system and need this info. 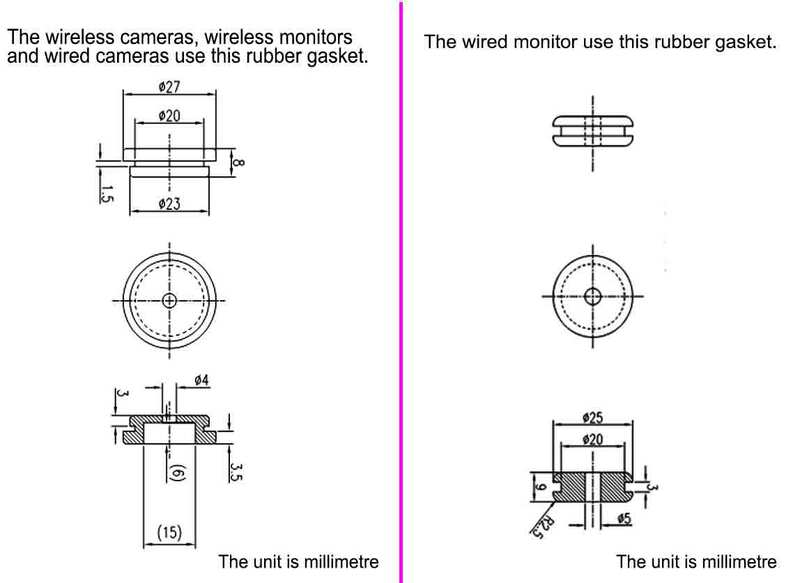 A: There is a waterproof rubber gasket on the camera cable. You can drill holes with a diameter of 20mm. Q：How do i know it's recording video? How do i start/ force it to record? A: 1. From the screenshot you sent, the top left corner shows the video loop.The icon in the upper right corner of the SD card indicates that the SD card has been connected, but no video has been recorded. If the video starts, you'll see the icon change. 2. On the screen of your previous screenshot, press "OK" and the recording begins, press OK again to cancel. Q: I don't know what to choose from wired or wireless, what is your suggestion? A：If you want to save money and have install tools, try the wired. 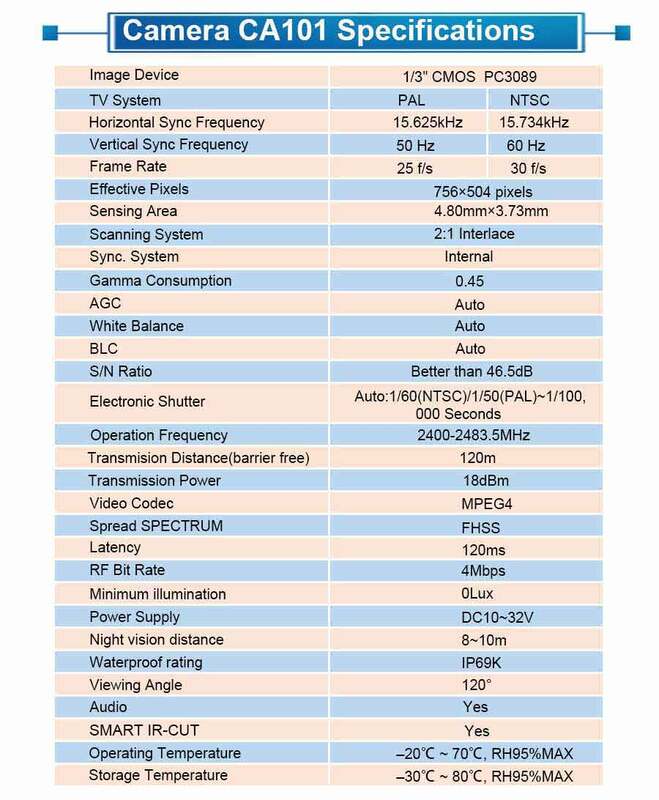 If you want easier installation, choose wireless MC7101.Our product's quality is better than competitors,but only half price of their. Q:I need to mount the camera offset on the back of my Class B RV so it will not be centered. Can i adjust the image so that when i am backing up it appears more centered? A:Wired Rear View System: If the camera is not centered, you need to calibrate the reverse cursor, then you can correct it in the menu bar in the monitor. Only the display position of the reversing cursor on the screen can be corrected, the image cannot be adjusted. However, the upper and lower viewing angles can be adjusted by adjusting the angle of the camera. Wireless system: The image display cannot be adjusted left and right. The reversing cursor is also fixed and cannot be adjusted. However, the upper and lower viewing angles can be adjusted by adjusting the angle of the camera. Please try to center the camera and then install it.